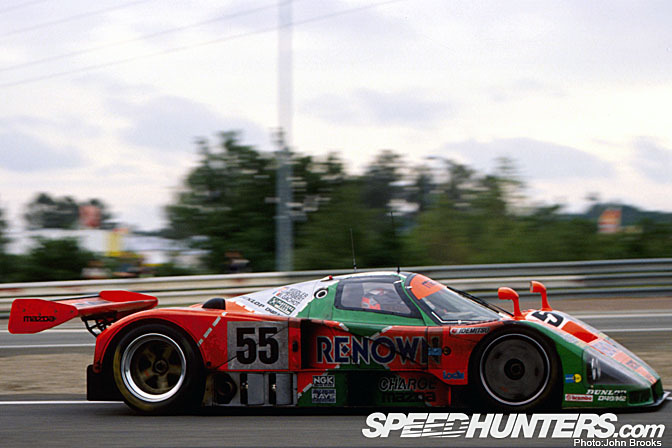 In motorsport, as with most other things in life, the 5 P's rule applies (Preparation Prevents Pixx Poor Performance) and it is hard to find a better example of the benefits of sticking to this rule than the circumstances surrounding Mazda's win in the 1991 Le Mans 24 Hours. No one would doubt the commitment of the drivers, the team and the factory but the foundations for what from the outside, seemed an unlikely victory, were laid many months prior to a wheel being turned at La Sarthe. 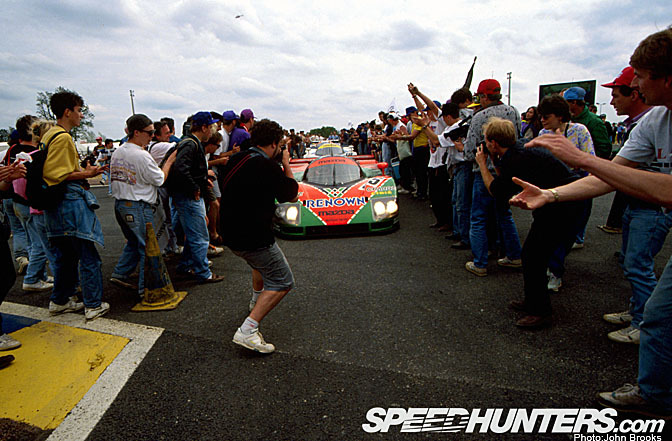 1991 proved to be the transition year for Endurance racing as the successful fuel restriction formula of Group C gave way to a rules package whereby the engines would be to the same specification as Formula One. We were told that this would lead to stability in the sport and cement the future of sportscar racing………….of course this was what is sometimes described as a lie ……….costs escalated rapidly reaching F1 levels without the return on investment, sportscar racing folded at the end of 1992 and nearly became totally extinct, but that's another story. So at Le Mans there were three sorts of challengers, Peugeot who had brought a purpose built 3.5 V10 rocketship to Le Mans, though without much hope of lasting to nightfall let alone twice round the clock. 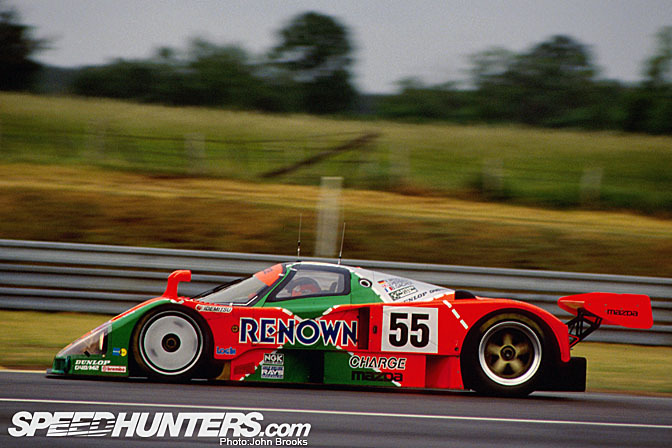 Then there were the conventional guys, Jaguar and Sauber Mercedes whose cars had taken the past three victories at La Sarthe plus the hordes of Porsche 962 privateers and of course with the rotary powered cars there was Mazda. The FIA took a keen interest in sportscars back then fearing that F1 might be challenged by the prescence of Jaguar, Porsche, Toyota, Mercedes, Nissan and Mazda to name but a few. Bernie Ecclestone contemplated the manufacturers competing in Group C and figured that they should be spending their budgets with him in Formula One. There was a tradition during the run up to the 24 Hours whereby the President of the FIA, Jean-Marie Ballestre, would hijack the ACO Press Conference to bellow and rant at anything or anyone who had recently upset him. In 1991 he was in fine form denouncing those who did not share his vision of the future, banging the table and abusing the non-believers, well history will judge who called that one right. In the pre-season rule negociations with the ACO and the FIA to determine how the transition year was to be managed the first priority was make the new "Category 1" cars (Peugeots etc) faster than the "Category 2" (Jaguars, Porsches, Saubers) to encourage the manufacturers to make the change to the new specifications. So the old cars had 100 kilos added to their lower weight limit bringing them up to 1000 kilos. I remember Andy Wallace telling me that at 1000 Kilos the Jaguars were almost undrivable by the end of a stint, the effort in pushing the brake peddle causing cramps and loss of feeling in the lower leg, progress and safety above politics and money, eh? 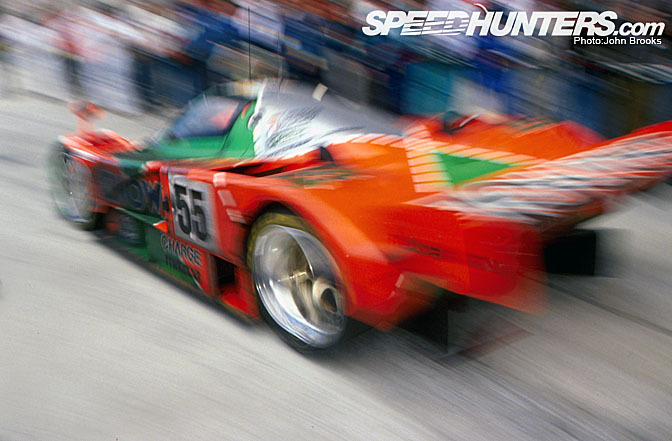 Somehow this did not get applied to the Mazda 787B. Perhaps someone was feeling guilty at the ending of the Rotary story given that Mazda had been competing at Le Mans since 1970. Perhaps the relatively poor performance of the team in the 1990 race meant that they were not taken seriously but being allowed to run at 830 Kilos (#55 was scrutineered at 845) gave them a serious performance break over the other Category 2 cars, especially in a fuel efficiency formula, less weight less energy needed to haul it round. The hero of the hour was Mazdaspeed team manager Takayoshi Ohashi who teased this all important concession out from the authorities during the first race of the season at Suzuka. There were other important changes to the Mazdaspeed effort the most visible being that ORECA now took over the day to day running of the cars. There were also developments to the Nigel Stroud designed chassis to increase downforce, together with larger wheels and carbon brakes. Mazda had also been at work improving an already impressive R26B engine that gave a claimed 700 bhp at 9000 rpm, and for 1991 there was an increase in torque of around ten per cent and better fuel economy. 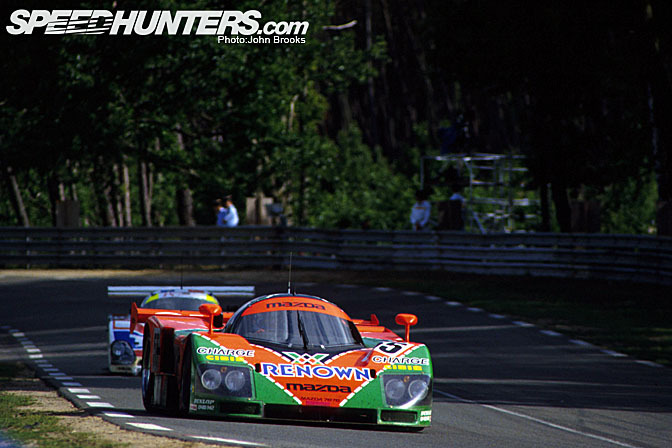 This was vital given that for Le Mans the Category 2 cars had only 2,550 litres of fuel to use in the 24 Hours. The driver squad was very strong with the youngsters all on the edge of the Grand Prix world. Johnny Herbert, who has become one of the most popular British drivers of the last 20 years, was one of those talents that come but once a generation. During his rise up the motorsport ladder he inspired favourable comparisions with legends such as Jim Clark and Jackie Stewart. His progress was halted as a result a horrific accident while racing at Brands Hatch, at one point he was in danger of losing his feet, so bad were his injuries. He struggled back to health and while making a comeback in Formula One he still had question marks about his fitness to race. 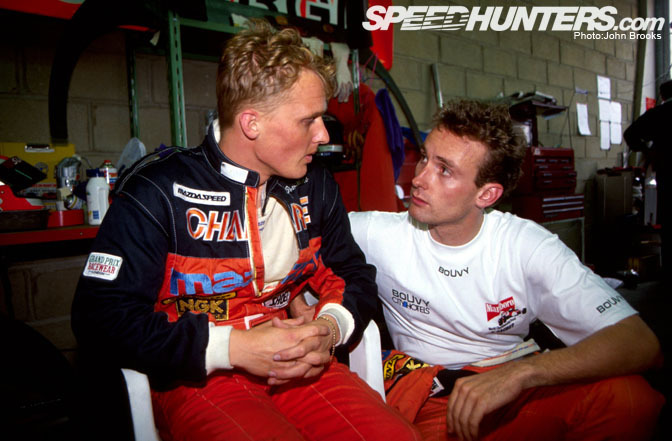 Bertrand Gachot was in his fourth season of Grand Prix racing leading the fledgling Jordan outfit and looking as if he had finally cracked it after several seasons spent with teams mired at the back of the grid. He had become a regular points scorer and seemed set for greater things. He was a truly European citizen, born in Luxemborg to a German mother with a French father. The third driver in the team was German, Volker Weidler who like Gachot had been struggling around the fringes of F1 and had then joined the band of ex-pats who plied their trade in Japan, racing both single seaters and sportscars. Qualifying was the usual conservative stuff from the Japanese team with 55, the fastest of the trio starting down in 19th. Due to some bizarre rules the whole process was a mess with the 10 Category 1 cars being lined up on the grid in front of the Category 2 cards regardless of the actual times recorded on the track. This had the happy consequence of two French cars (in a French race, in France) leading off the field at the start despite being some four seconds off the fastest car, the Sauber Mercedes of Jean Louis Schlesser. Unknown to the rest of the competitors the management at Mazda had a complete change of heart, instead of the cautious, conservative approach that had been the guiding principle of Mazda's Le Mans' campaigns they were going to let the three speed merchants off the leash in search of an outright victory.. The logic behind that decision ran along these lines. Peugeot, fast but fragile so discount them. Jaguar, unable to cope with the extra weight, the same applied to the squadron of Porsches so the target was the Sauber Mercedes team. Sauber had three of their C11 coupes on hand with a very experienced line up of drivers plus a few new boys, including one Michael Schumacher, still to get his first ride in Formula One. There would be a connection with the 55 Mazda when this happened a few months later in the year but more of that later. The Swiss/German outfit could pound round at a race pace of 3:40 to 3:44 which was a few seconds in front of the Mazda' s best so all the Japanese could do was drive as fast as possible, spend no extra time in the pits and wait for tthe pressure to get to the Saubers. "Michael, I want you to drive flat out. I want Porsche to win Le Mans." and "A lot of people go through life doing things badly……..Racing's important to men who do it well. When you're racing, it…..it's life. Anything that happens before or after…..is just waiting." For MazdaSpeed, Herbert, Gachot and Weidler racing was about to become life as they would drive flat out in pursuit of victory. NB For those who have not seen the film, go and do it soon………there is no real plot, the dialogue is sparse but the on track scenes are fantastic, arguably the best that Hollywood has ever come up with. At 4.00pm on Saturday the flag dropped and the race was on. As predicted the Peugeots sprinted into an early lead but this only lasted as long as the first set of pit stops when one car was set on fire, by the time this was put out that Peugeot had lost 14 places. A few minutes later and the other Peugeot had an ignition problem that would require the complete wiring harness to be replaced leaving them down in 35th position. Bye bye to the rocket ships……….. 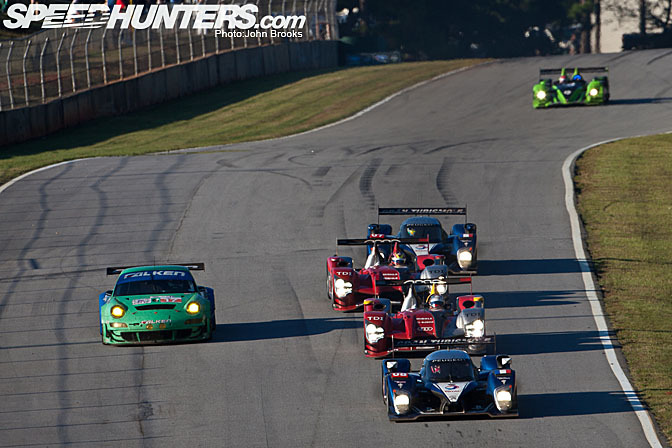 So now it was Sauber 1-2-3 and by the 6th hour on track the Mazda was up to 4th place and keeping the pressure up. Who would blink first? Well the answer to that was the Palmer/Dickens/Thiim Sauber that lost nearly 40 minutes having the undertray replaced after hitting debris at high speed. This put our heroes in Mazda 55 up to 3rd place, a position they held at 4.00am on Sunday morning, the halfway point of the race. Forty minutes later the next problem hit the Sauber steamroller. Karl Wendlinger pitted complaining of gear selection problems. Several attempts to make a quick fix over the following couple of hours did not work and eventually all the internals in the transmission were replaced costing the crew of Wendlinger/Schumacher/Kreutzpointer over 45 minutes and leaving them ten laps off the leader in 8th place. Tension was mounting in the pit as the Mazda, now up to second roared on, turning up the pressure on the surviving Sauber. While the sun rose in the sky and the spectators woke and enjoyed breakfast, the duel between the teams continued. 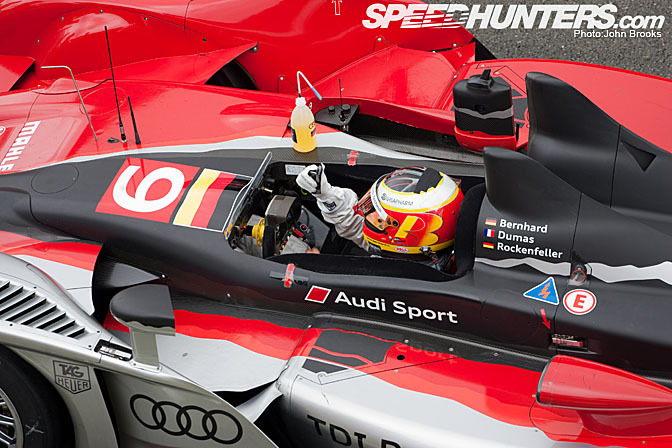 Although the Sauber was four laps up on the Mazda, there was no relaxing. On and on towards the finish, till at around Mid Day, the race took another dramatic turn. The radios were full of commentators getting excited – there was some kind of smoke coming from leader. In fact the alternator mount had broken, breaking the water pump belt, cooking the engine. They was a lead of around 12 minutes, could the problem be fixed in that time frame? No it could not………..at just after 1.00pm the Mazda slipped noisily into the lead, the roar of the engine being matched by the roar of the crowd, something special was happening before their eyes. The stricken Sauber was stuck in the pits for 35 minutes but after one more lap it was pushed into the box and retirement. Now it was the turn of the Japanese management to fret and worry as the laps passed and the clock headed for 4.00pm and the finish. Finally the moment was here and the crowd invaded the track preventing 55 from crossing the finish line but nothing could take away the amazing achievement of outright victory for the 787B. Johnny Herbert had driven himself to a standstill and was taken not to the podium but to a first aid tent to try and rehydrate. He did mange to join in a bit later. 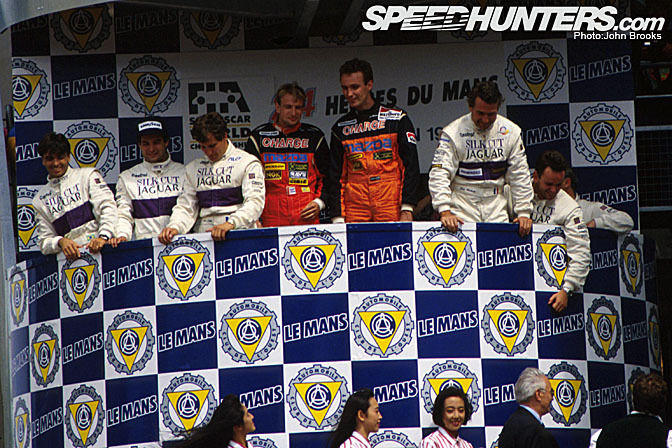 For the two other victors the 1991 podium at Le Mans was the high point of their racing careers. 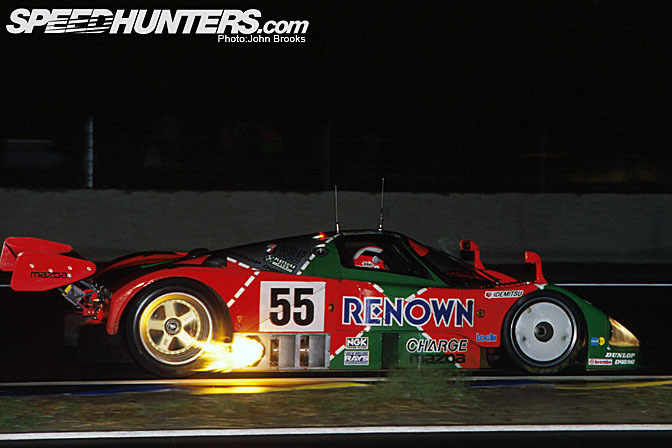 Weidler was forced to retire from motorsport the following year with hearing problems caused by it was said the noise of the Mazda's engine. 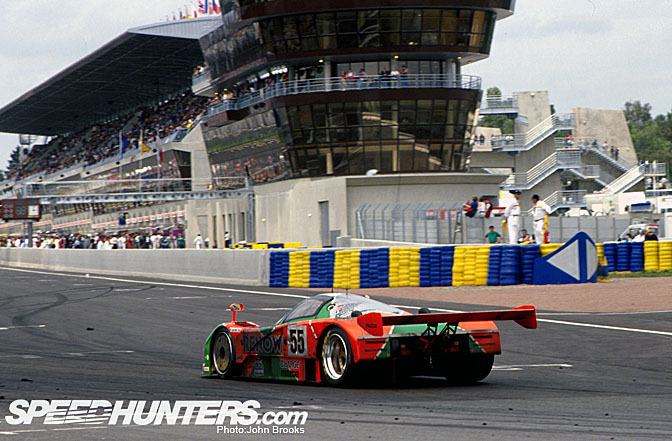 Gachot's fall from grace had already happened some six months before the Le Mans race. He had been involved in a dispute with a London Cabbie and had used a CS gas spray on the other driver. To his surprise the month after Le Mans he received a prison sentence of six months, so instead of going to a Grand Prix he went to jail. He served two months, missing his home race at Spa, where a certain young driver made his F1 debut in the Belgian's place. This was the launch of Michael Schumacher's Grand Prix career and the effective end of Gachot's. 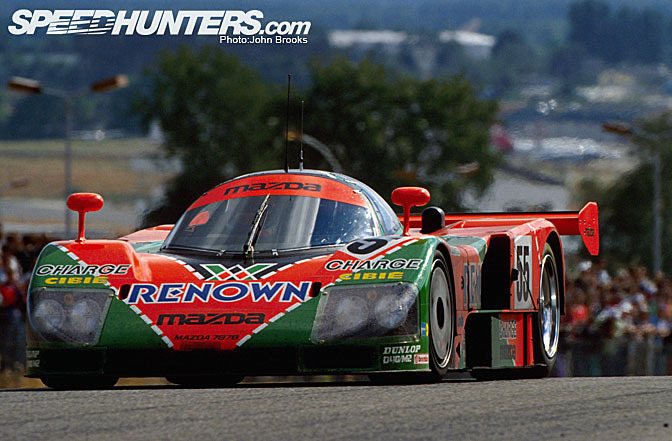 The whole 1991 MazdaSpeed effort was almost perfect, with the other two cars finishing 6th and 8th. The winners had completed 362 laps, 3,059 miles, man, machine and team working in harmony. 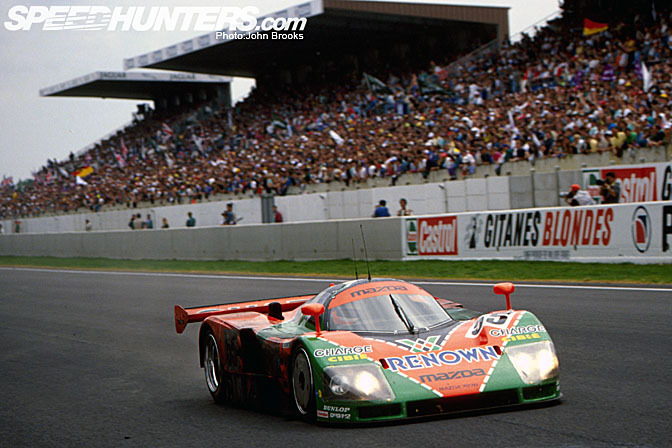 The Mazda 787B has passed into legend and fully deserves its place in history. Wallpaper please of the photo with the flames spitting from the side! The best GTP car ever!! Love it and I also have a 1/18 scale model of this machine. You are the ultimate awesome. luis - Re:- Gachot, it pretty much did. Once he was released he got a ride with Larrouse Lola but the car wasn't very competitive. He then raced for Pacific F1 and then Coloni-Subaru. After that, he did some Sports car work with WR and I think that was about it. He is a big player in the Hype Energy Drink today. Johnny Herbert's other team mate didnt fair much better. IIRC it was the following year that Volker Weidler has to drop his drive in Japanese F3000, despite leading because of hearing loss. I dont think he raced again. Sir John Brooks, you are THE MAN. Too bad pictures don't have sound. The noise this thing produces makes it twice as cool. Great post, thanks. 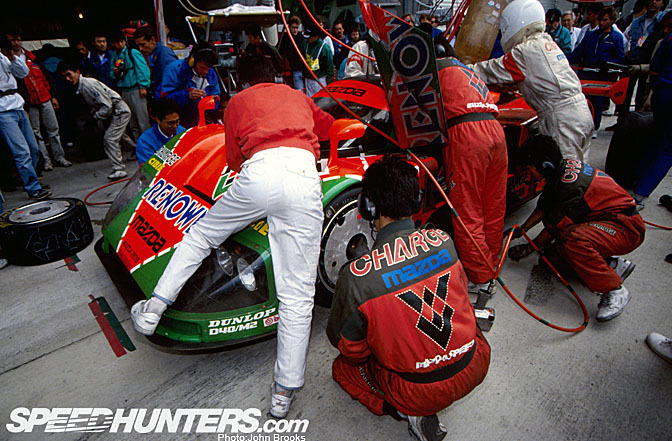 The Mazda team cherishes the 91 victory from lots of respects first, because it was our last shot at a rotary victory. Next being the first and only Japanese victor is also something we appreciate. Most importantly as a company facing challenges the will to never give up given our performance from 1990 at LeMans is a rallying cry here at Mazda even today. That win was pre-Internet -- I never knew all the details or got to see such great photos (even though I was driving a new MX-5 Miata at the time). Thanks for filling-in the blanks. Fantastic story, great photos, excellent work. Great car driven by some great drivers. I was always a massive fan of Johnny Herbert! An awesome talent! This was not an article. This was an amazing story. I got chills reading this article. Excellent article John Brooks! I don't think anyone could describe that moment better than you. Must be an amazing thing to see a underdog beating all the other well known and better teams such as Sauber, Jaguar and Peugeot. This is the best explanation of the race I ever read or heard (English or Japanese). Much better than any video or story of this win I've read so far. .i.e what happened to the drivers after 1991. Is this story all new or is this a story copied from a previous document somewhere? There are some photos I have never seen. This is really great. Thanks. what a great bunch of people you are.........thanks for the kind words, it certainly encourages us all here at SpeedHunters to get positive feedback. @Robert.........Mazda should cherish the win, as no other Japanese manufacturer has managed this despite the mega budgets that both Nissan and Toyota threw at the problem. In a sense it is a perfect metaphore for the brand values of Mazda, Peformance, Ingenuity, Reliability, Value for Money.........there I've nearly posted a commercial. @Kelvin.................the story is new, written by me with some help from my good friend Andrew Cotton. I also had plenty of reference material and have spoken to various key players over the years such as Hugues de Chaunac of ORECA and recently Johnny Herbert who was racing out in Dubai, plus of course I was there and if I remember correctly working for Dunlop that year. Once again thanks.............1992 is next. That has to be the riveted i have been to a post in a long time...so much so, i've just missed a meeting... thank you John! Awesome, brilliant...fantastic! I enjoyed reading every bit of this post. One of my favorites so far! You may be interested to know that we have a unrestored example of MX-R01 (Judd V-10 DOHC) here at our office in Irvine California with the Kajima sponsored colors. Looking forward to your 1992 story.